Each of the 40 rooms at No.15 Great Pulteney come with their own distinctive character. Many of the rooms feature works by the promising next generation of Great British artists, lending each a bright and unique character. If you're after an unrivalled sybaritic experience, we recommend plumping for the Hideout Suite which comes with your very own hot tub and sauna.It's worth noting that, while the main building has lift-access to every floor, the Coach House is not suitable for those with accessibility issues. If you're travelling with your dog, please let us know as there are dog-friendly rooms available. Designed by owners Ian and Christa Taylor, most of the Cosy Double rooms are set up on the top floor and offer amazing views over Great Pulteney Street or Henrietta Park. 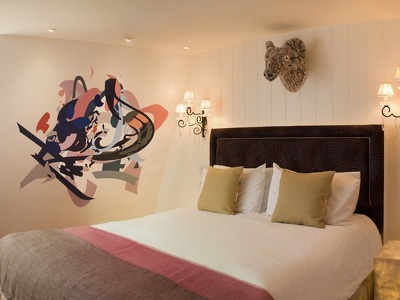 The attention to detail is impressive, from the bespoke wall-art painted by local artists to the Aromatherapy Associates bath and body products, marble washstands and copper hand basins in the ensuite bathrooms, not to mention the Hypnos Lansdowne Cashmere beds. The Deluxe Double rooms are elegantly proportioned, with high ceilings that deliver a sense of light and space and sleep two. Two of these rooms have been designed by local interior designers Rossiters of Bath, and the inspiration of the afternoon and evening light of the nearby Henrietta Park can be seen in the rich floral design or enigmatic enchanted forest décor of the Good Afternoon and Good Evening rooms respectively. Situated in the mock-Gothic Coach House set back from the main house, the Coach House Deluxe Doubles feature a décor of muted shades accented by bold splashes of colour and quirky artwork. The uniquely tiled ensuite bathrooms will delight you with their rain showers and Aromatherapy Associates products, with some of the rooms featuring baths in addition. 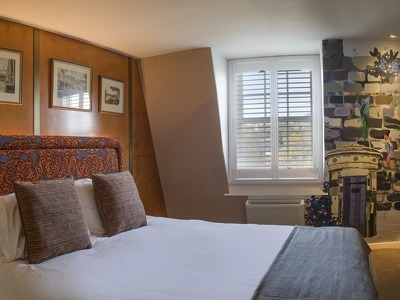 The Coach House Deluxe Doubles sleep up to two people in the supremely comfortable king-size beds. It’s worth noting that these rooms are not accessible for wheelchair users. 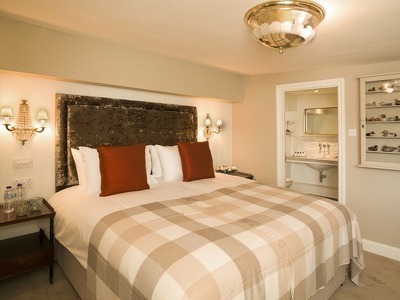 The generously sized Large Deluxe Double rooms feature either a luxurious king-size bed or a separate sitting room. Idiosyncratic art choices lend each room a real sense of character, and a comfortable seating area gives you a private space to relax. Bathrooms are fully furnished with Aromatherapy Associates bath and body products, and the rooms feature Hypnos Lansdowne Cashmere beds. Three of these rooms come with sofa beds that are suitable for two children or one adult. The spacious Henrietta Junior Suites are inspired by the colours of the original Georgian plasterwork, evoking the building’s framework and history. Clear plexiglass furniture adds to the sense of light and space, and the statement lighting allows for an ambience to suit every mood. Bathrooms are furnished with mirrored walls, marble-topped washstands and artisanal Bamford body and skincare products for extra luxurious ablutions. A couple of these rooms come with sofa beds that are suitable for two children or one adult. 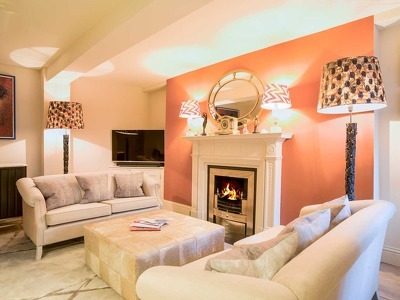 The individually designed Coach House Junior Suites are styled in a range of palettes, and contain unique features such as fireplaces or quatrefoil windows depending on the room. Ensuite bathrooms feature Mandarin Stone fittings, luxurious free-standing baths for two and rain showers, and the ambient lighting can be tailored to your mood. It’s worth noting that these rooms are not accessible for wheelchair users. Two of these rooms come with sofa beds that are suitable for two children or one adult. The commanding proportions of the Pulteney Junior Suites and lofty ceilings create an unrivalled sense of grandeur. 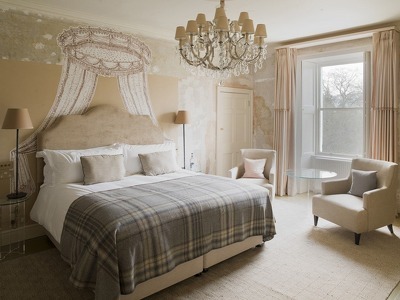 Original sash windows give an exceptional view of Great Pulteney Street, while small touches in the décor, such as the four-poster bed, evoke the history of the building while maintaining a contemporary feel. The bathrooms feature bespoke hand basins and freestanding baths, complete with artisanal Bamford body and skincare products. 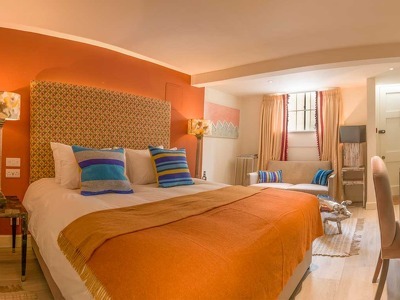 In addition to the king-sized beds, these rooms also contain sofa beds that are suitable for two children or one adult. The decadent bathroom is the highlight of the Hideout Suite, which creates a private spa complete with a spacious hot tub and personal steam room. 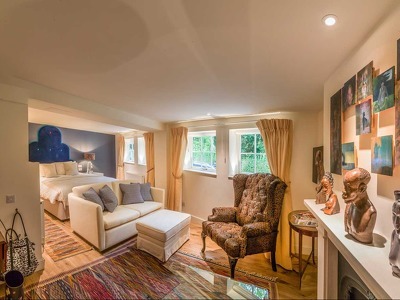 The sitting room is the perfect place to snuggle in front of the gas fire, and the adjoining bedroom opens out onto the garden, making this the perfect romantic den. No.15 Great Pulteney is an impressively luxurious and forward-thinking boutique hotel in Bath, hidden behind an imposing Grade I listed Georgian façade on Bath’s grandest street. Owners Ian and Christa Taylor have designed No.15 with an awareness of Bath’s heritage as the original trendy getaway, but an imaginative approach to these traditions will captivate the contemporary chic set as well. Visually stunning in so many ways, we love the rich array of modern artworks on display. Lauran Sagar's Lost Earing Chandalier, made from over 5,000 individual earrings, sparkles above the sitting room; delicate, playful works by acclaimed glass artist Adam Aaronson illuminate the hotel's hidden nooks and intimate corners. From the exposed original stonework in the underground spa to the curated cocktail menu printed on decks of playing cards in the bar, No.15 Great Pulteney continually aces the small details, making it a hotel you will want to revisit time and again. Four-legged friends are welcome. It was the waters of Bath that first attracted the trendsetters of the Georgian period, and No.15 Great Pulteney has fully brought this tradition of ‘taking the waters’ up to date. Let your worries wash away in the cedar-wood hot tub located in the historic vaults beneath the pavements of Great Pulteney Street. Follow this up with an ‘Inner Peace’ treatment at the hands of one of No.15’s skilled therapists, using Himalayan salt and essential oils of rose, sandalwood and jasmine. 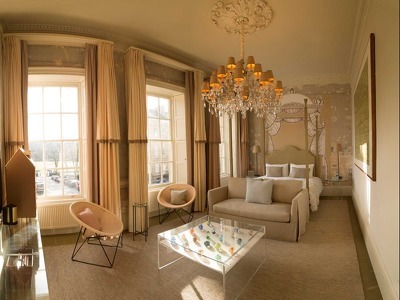 No.15 Great Pulteney's central location makes it the perfect hotel from which to explore the sweeping crescents of Bath and, with past residents ranging from Jane Austen to anti-slavery campaigner William Wilberforce, Great Pulteney itself is the perfect gateway to this fascinating city. Cafe 15 serves uncomplicated but beautifully executed dishes in a relaxed dining room, lined on one side by an antique chemist’s unit, complete with glass philtres and apothecary bottles. If visiting on a Sunday, be sure not to miss the brilliant brunch menu, which not only includes hearty classics made from the finest ingredients but also free-flowing Bloody Marys or prosecco. The highlight of any stay at No.15 Great Pulteney is the exquisite Afternoon Tea, which offers a unique blend of the quintessential and the curious. Fresh scones and homemade jam sit beside innovative takes on the classics such as the blackcurrant, yuzu and coconut set cream and Persian love cake. These treats are paired with one of the many teas in No.15’s curated collection, or if you prefer with a glass of bubbly. Whilst dogs are not allowed in the restaurant, they are welcome in the bar. You’ll find the hotel in the centre of Great Pulteney Street, just a couple of minutes’ stroll from Bath Abbey and opposite the Recreation ground. No.15 is a short taxi ride or a 10-minute level walk from Bath Spa Station. From the south via the A36 (Warminster Road): Follow main flow of traffic for the town centre and the road drops down a slope over the canal and around to the left. The road then divides into two with a park on the left and traffic lights ahead of you (Bathwick Street). Take the left-hand lane alongside the park and after about 150m, take the second turn on the right, directly opposite the Holburne Museum. This is Great Pulteney Street and you'll find No.15 half way along the street on the right-hand side. From the M4 via the A46 (Gloucester Road): Nine miles from Junction 18 of the M4, leave the dual carriageway at the slip road signposted for Bath (keep an eye out for the camera on the dual carriageway, about 1 mile from the exit, where a 50mph speed limit is in force). Take the 3rd exit into the town centre. After approximately 1.5miles after passing Morrisons supermarket on your left, you will come to a major junction. Keep in the left hand lane approaching this junction and follow the signs for Warminster for the next half a mile. Keep going straight until, immediately after a row of shops on your right (Bathwick Street), you see a park ahead of you. Keep to the right hand lane. The road bears right. Take the second road on the left, directly opposite the stately Holburne Museum. You are now in Great Pulteney Street and No.15 is located halfway down the street on the right-hand side. From Bristol and the West via the A36 (Lower Bristol Road): Follow the A36 into Bath and keep going straight. Keep the river to your left the whole time and continue to drive essentially straight. Still on the A36 you will pass under a railway bridge at some traffic lights (Pulteney Road). Stay in the right hand lane and continue straight. Go straight over the roundabout at the bottom of Bathwick Hill and take the first turn left into Great Pulteney Street, directly opposite the Holburne Museum. No.15 is halfway along on the right-hand side. Standard rate: 15% deposit is taken atthe time of booking. Standard rate: Can be cancelled or amended up until 2pm the day prior to arrival, cancelling/amending after this time you will be charged the first nights’ accommodation. Please ask Reception if you require a late check-out. Up to 12 noon is complimentary, then charged at £10.00 per hour for each additional further hour. Some of the rooms at No.15 Great Pulteney are dog-friendly, so please advise us if you would like to bring your furry friend as the hotel are unable to accommodate them in all room types. The cost of £15.00 is per dog, per night and includes a bed, bowl and treat box. Kindly note, dogs are unable to join you in the restaurant however the full menu is also on offer in the Bar where dogs are welcome. Each of the 40 rooms at No.15 Great Pulteney come with their own distinctive character. Many of the rooms feature works by the promising next generation of Great British artists, lending each a bright and unique character. If you're after an unrivalled sybaritic experience, we recommend plumping for the Hideout Suite which comes with your very own hot tub and sauna. It's worth noting that, while the main building has lift-access to every floor, the Coach House is not suitable for those with accessibility issues. If you're travelling with your dog, please let us know as there are dog-friendly rooms available.